Energy-harvesting yarn; compound perovskite solar cells; nanodiamonds for safer batteries. Researchers at the University of Texas at Dallas and Hanyang University in South Korea developed a carbon nanotube yarn that generates electricity when stretched or twisted. Possible applications for the so-called “twistron” yarns include harvesting energy from the motion of ocean waves or from temperature fluctuations. When sewn into a shirt, these yarns served as a self-powered breathing monitor. 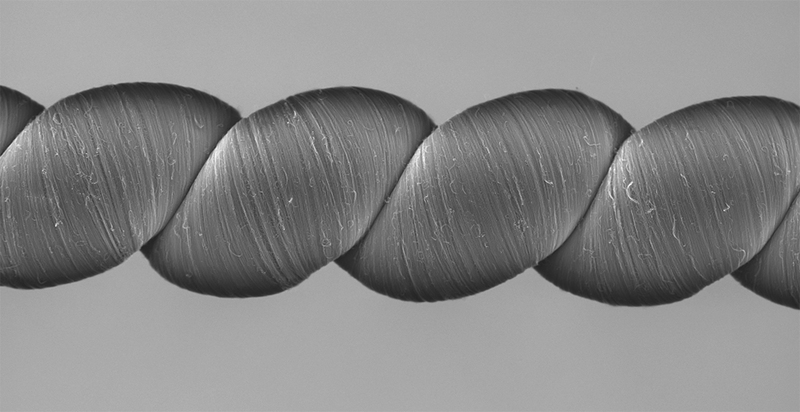 The researchers twist-spun carbon nanotubes into high-strength, lightweight yarns. To make the yarns highly elastic, they introduced so much twist that the yarns coiled like an over-twisted rubber band. In order to generate electricity, the yarns must be either submerged in or coated with an electrolyte, which can be as simple as a mixture of ordinary table salt and water. When a harvester yarn is twisted or stretched, the volume of the carbon nanotube yarn decreases, bringing the electric charges on the yarn closer together and increasing their energy. This increases the voltage associated with the charge stored in the yarn, enabling the harvesting of electricity. To show that twistrons can harvest waste thermal energy from the environment, the team connected a twistron yarn to a polymer artificial muscle that contracts and expands when heated and cooled. The twistron harvester converted the mechanical energy generated by the polymer muscle to electrical energy. The researchers also sewed twistron harvesters into a shirt. Normal breathing stretched the yarn and generated an electrical signal, demonstrating its potential as a self-powered respiration sensor. The yarn was also able to use sea water as an electrolyte, generating electricity when stretched by ocean waves. Researchers at Stanford University developed a new concept for perovskite solar cells, inspired by the eyes of insects, designed to protect the fragile material from deteriorating when exposed to heat, moisture or mechanical stress. While perovskite solar cells are promising for their efficiency and low cost, they have short life spans, degrading quickly when exposed to real-world conditions. Making them more stable is currently a major focus for perovskite researchers. Using a fly’s compound eyes as a model, the team created a compound solar cell consisting of a honeycomb of perovskite microcells, each encapsulated in a hexagon-shaped scaffold just 0.02 inches (500 microns) wide. The device is also more resilient than typical perovskite panels. The researchers exposed encapsulated perovskite cells to temperatures of 185 degrees Fahrenheit (85 degrees Celsius) and 85% relative humidity for six weeks. Despite these extreme conditions, the cells continued to generate electricity at relatively high rates of efficiency. The team has filed a provisional patent for the new technology. To improve efficiency, they are studying new ways to scatter light from the scaffold into the perovskite core of each cell. Researchers at Drexel University, Tsinghua University, and Hauzhong University of Science and Technology found that using nanodiamonds in the electrolyte of lithium-ion batteries prevents dendrite formation, making the batteries less prone to short circuits and fires. As ions move between the two electrodes of a li-ion battery, metal whiskers called dendrites can form. After enough charges and discharges, they can reach the point where they push through the separator, a porous polymer film that prevents the positively charged part of a battery from touching the negatively charged part. When the separator is breached, a short circuit can occur, which can also lead to a fire since the electrolyte solution in most lithium-ion batteries is highly flammable. To avoid dendrite formation and minimize the probability of fire, current battery designs include one electrode made of graphite filled with lithium instead of pure lithium. The use of graphite as the host for lithium prevents the formation of dendrites. But lithium intercalated graphite also stores about 10 times less energy than pure lithium. 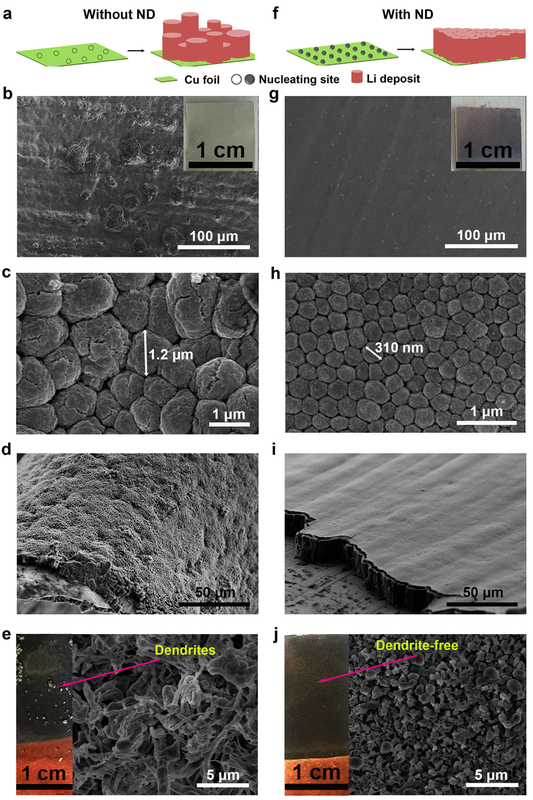 If dendrite formation can be eliminated in pure lithium electrodes, a great increase in energy storage is possible. Nanodiamonds have been used in the electroplating industry for some time as a way of making metal coatings more uniform. When they are deposited, they naturally slide together to form a smooth surface. The researchers found this property to be useful for eliminating dendrite formation. In the paper, they explain that lithium ions can easily attach to nanodiamonds, so when they are plating the electrode they do so in the same orderly manner as the nanodiamond particles to which they’re linked. They report that mixing nanodiamonds into the electrolyte solution of a lithium ion battery slows dendrite formation to nil through 100 charge-discharge cycles. Initial results show stable charge-discharge cycling for as long as 200 hours, which is long enough for use in some industrial or military applications, but not nearly adequate for batteries used in laptops or cell phones. Researchers also need to test a large number of battery cells over a long enough period of time under various physical conditions and temperatures to ensure that dendrites will never grow.